I am a balloon pilot, and am looking for a backup handheld GPS to use during flight. I think my requirements are very basic, but I have a hard time finding one that meets all of them. Especially the heading in degrees seems to be a problem. I am fine with older models, as long as they work. Oregon 450 and newer models: also questions about heading and baro alt. Montana 600 and newer. Seems to have everything, but is kind of an overkill. On the Etrex models you can select data fields that give heading and glide ratio, so they should cover your needs. Same with the Montana but I have no experience of the other models. I've looked at the etrex models (30x) but could not find an example of the heading in degrees. I don't remember which model, but one of them only indicated N, E, S,W. Do you know if the etrex 30x gives heading in actual numbers? We 'steer' by moving between different winds aloft. Going up or down 50 ft. or so can make a difference of several degrees. The altitude on the same screen mounted at eye height would be ideal. Right now I use a tablet with a flight recorder, which is not in my line of sight. You can set up 'pages' with numerous datafields so you could see on one page all you want. I'll try to post a screenshot later to give you an idea. By default it will be set to Directional Letters But you can go into Heading setup and change it to Numeric Degrees or Mils. You can also set the North Reference to True, Magnetic, Grid or User. 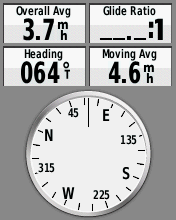 You can configure the data fields so you could put heading, altimeter, speed (it will be ground speed) and Vertical Speed on the same screen. It uses 2 AA batteries but you can put rechargeable batteries in it. I would highly recommend Panasonic eneloop batteries. Battery life will not be a problem it’s rated at 25 hrs. Thanks for all the information. It sounds like the 30x will work for me. It should work well for you. Garmin makes a bike mount that zip ties on. You should take a look at it. The description says it fits up to 1 inch however it will go a lot bigger than that. I would think you would have something on your balloon to zip tie it to at eye height. I would get a Montana 680 series over any etrex. Much better screen and flawless functions. Best one Garmin has out now for touch screens. I keep a pointer pen in my pocket, don't like touch screen and gloves. As for using the non-aviation devices for altitude, the marine devices, hand-helds for hiking and sporting devices for cycling that I have quite a few years of experience typically do not allow you to easily adjust the barometric setting if at all. Many to me would be very cumbersome to apply a correction and even require you to go to a point that you know the elevation for and enter the elevation, then it figures your to the relative setting. I don't think any of mine allow you to set elevation correction by simply entering the "local altimeter" setting as is norm for any aspect of air navigation, but I've probably never been too interested in doing that with many as elevation isn't too important as long as the boats still floating, so I might be proved wrong. I'd think a device made for aviation will allow you to adjust the altimeter setting to the correct value as easily as you do on a standard barometric altimeter in an aircraft dashboard. Well almost....... let's face it, spinning a knob is about as simple as it can get, so maybe a few more steps on a multi-function electronic device. Take a look at the Garmin D2 Delta and D2 Charlie wrist watches on the page in the link above. They have an barometric sensor and the manual shows it to be settable manually by entering the correct local altimeter (barometer setting). The Garmin aera's, while packed with lots of navigational features sadly lack a barometer. I got out of aviation before Garmin got into the market, but I like the features I see in them for recreational flying. Don't have any acquaintances from my flying days that have any experience with Garmin Aviation products either. Maybe you can find some that do. Those that build experimental (home-builts) and ultra-light aircraft are probably the most familiar with them. You might also look at the Garmin GLO, which is a bluetooth GPS receiver with a very high refresh rate which makes it suitable for aviation (10 updates per second as opposed to one per second on their handheld devices). I have one of these and it's very nice and quite accurate. It includes a 6 month subscription to their "Pilot" software which you can run on a phone or tablet and (I think) get all the functionality of the aera for $100. HOWEVER... the OP said he wanted a barometric altimeter and neither the aera 660 or Garmin Pilot will give you that feature. In fact, I don't see that feature listed in any of their aviation portables. The reason I was looking for these specific features was because I would like to have this information at eye height in addition to the mandatory flight instruments and flight recorder onboard, which are mounted in the basket, and requires me to constantly have to look down. Hot air balloons are steered by moving between different wind layers aloft which sometimes only vary by a few degrees, too little to notice without gps. With this information in my line of vision I can see exactly at which altitude I need to be to move in the desired direction without having to look up and down constantly. This is especially important when trying to reach a landing site in a congested area. Since my initial post I heard about a new FAA STC flight instrument by Digitool which recently has been approved for my system. It is about the size of a Nuvi and includes the pyrometer in addition to all the other info, and can be mounted at eye height on the burner frame. It costs a little more ($1000+) but is still almost half of the standard Flytec 3060 instrument. Instead of adding an Etrex 30x or Montana to my standard flight instruments I am now considering the new Digitool, which would replace my analogue instruments all together. Again, thanks for all the advice, I appreciate it.